January | 2011 | E-verything! One of those rare sessions where I was not actually there! I was laid low by a migraine and was unable to join this exciting recorded session by Shelly Terrell. So as I have said before “recordings are a wonderful thing” because even though I wasn’t there I am still able to write an overview. Phil did a great job on the introductions etc and Shelly was, as always, fabulous! I am so sorry that I missed the live session – I was really looking forward to it and although recordings are great the lack of ability to participate is very frustrating. Shelly began with some introductory information and talked about the most simple forms of graphic organiser. She used a simple graphic organiser (GO) format to ask for input from participants on what they already knew about them and then what they would like to know/find out.The “what we already know” made a great Wordle! The next part of the session included a variety of ideas on using GO with students – Shelly showed us some great images of mind maps/GO from her students. Shelly then moved on to look at some online GOs especially for mobile use, again sharing brilliant ideas on using these with students particularly for collaborative activities. Next Shelly used Application Share to share a wiki with links for a wide variety of graphic organisers/mindmapping. This includes paper-based, downloadable, online, rubrics and many extra ideas and resources. Shelly then showed us some of the ones she has used giving a great “flavour” of what is available! Finally it was a return to the original graphic organiser to complete the “what as been learnt” and “how to find out more” sections. As is always the case with Shelly’s sessions this was terrific! From watching the recording I have learned much more about GOs and how they may be used. The links provided via the wiki are invaluable and once again I have a huge list of things to check out from one of these sessions. Our next session is an Edublogs “Serendipity” session on Thursday Feb 3rd at 23:00 GMT/UTC (6pm USA EST, Midnight BST) or Friday Feb 4th at 1am CEST, 7am West Aus, 10am NSW, depending on your timezone – in the usual Elluminate room. This is one of our fortnightly unconference sessions where we invite you to bring along your “hot topics” and “burning issues” for our poll on the topic of the day. If you want to propose a topic in advance then visit the Serendipity Wallwisher and add your topic. This was a timely session, recorded as usual. The choice of topic was class blogs and there are two blogging events relating to this that are either underway or soon to start. The first of these is the Teacher Challenge the current challenge is getting started with blogging – its not too late to join this challenge right now if you want to! The next challenge will be getting students started with blogging in preparation for the Student Blogging Challenge itself. We started the session by sharing the links to our own blogs, and talking a little about class blogs. In my opinion (and I think that of many others) no-one gives better or more comprehensive information about blogging with students than Sue Waters of Edublogger fame. So logically as we didn’t have Sue with us the next step was to use Application Share and share some of her fantastic posts on class blogs and student blogging. The posts gave us the answers to many questions on the whys and wherefores of class blogs and students’ own blogs. A really interesting session where the focus was very much on knowing where to find what we wanted to know rather than anyone knowing a huge amount about the topic. 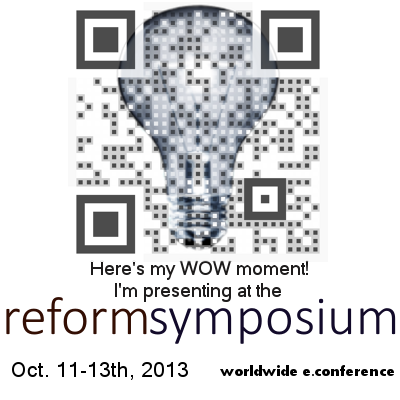 Edublogs webinar overview – Pay for software you have to be joking! This was a great recorded session even though we were a very small group. Phil who is @philhart on Twitter did a terrific job and I really enjoyed being a “participant” and leaving most of the hard work to him! After the usual preliminaries Phil started the session by checking that we had all recieved the file he had sent to us by file transfer. This is a listing of some free software that can be downloaded or accessed within the cloud. NB if you access the recording this file will also be automatically sent to you. Phil asked us what software we already use or would want to use. He then moved on to ensuring that we all had a similar understanding of the terms “Open Source”, “Closed Source” and “Free Software”. From my own perspective it seems that the term “Free Software” is one that could provide much food for discussion in its own right! It is often used, in my opinion inappropriately, by suppliers for restricted and time limited trial versions. We than moved on to sharing our experiences with some different free software Afterwards Phil raised the issue of the pros and cons of free software and what we can do to mitigate the possiblew impacts of the “cons”. As Phil was looking at both downloadable and cloud-based applications we also took a look at the concept of cloud-based computing and some of its possible disadvantages! The rest of the session was a discussion on some of the available software including links for sites which have a variety of free software available. I learned lots from this session both from Phil and from the other participants! If you’re considering the possiblity of using free software or if you are already looking for something specific then its well worth catching the recording. Our next session is an Edublogs “Serendipity” session on Thursday Jan 20th at 23:00 GMT/UTC (6pm USA EST, Midnight BST) or Friday Jan 21th at 1am CEST, 7am West Aus, 10am NSW, depending on your timezone – in the usual Elluminate room. This is one of our fortnightly unconference sessions where we invite you to bring along your “hot topics” and “burning issues” for our poll on the topic of the day. If you want to propose a topic in advance then visit the Serendipity Wallwisher and add your topic. Firstly an apology, well actually two apologies! the first one is because I was a bit slow at starting the recording so the actual choosing of a topic wasn’t recorded. Secondly I have been extremely slow at doing this overview post! There is even a third – I have not updated the Edublogs and LearnCentral calendars yet, I hope to do so in the next few days. My conclusion from the above is that I really shouldn’t have holidays as I seem to be incapable of getting myself back into gear. It may be something to do with the fact that I don’t re-start at work for another two weeks & I am still behind on all the other things I planned to do during the holiday! 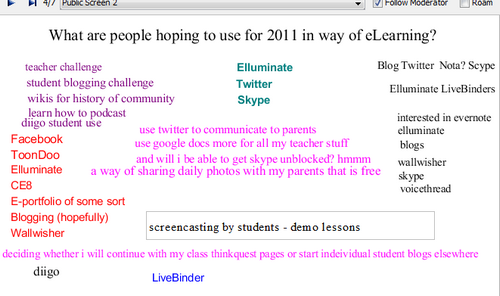 The topic chosen was what are we “hoping to use for 2011 in the way of elearning”. Despite my messy start we do have a recording and the session was terrific with much sharing through audio and text so the recording is well worth catching. Once we had decided on the topic we started with a whiteboard, which in fact we continued to use throughout, for our initial thoughts on what we hope to use this year. This whiteboard was added to throughout ending up as above. So the whiteboard formed the focus around which we used text and audio to share and discuss our experiences and hoped for experiences with some of these tools. This session provided great opportunities to share possible tools for specific purposes and I think we could have carried on for much longer if time had allowed. This was a great session, as I have said before every time we have Serendipity sessions that touch on Web2.0 tools I meet new tools that I need to explore. I hope/feel that this might be the case for other participants also. Just that feeling of adding another potential “tool” to my “teacher toolbox” is always exciting.